Pop’s Italian Beef and Sausage is a Chicago-based chain specializing in Italian beef sandwiches, as well as a number of other offerings. An Italian beef sandwich is similar to a Philly Cheesesteak, but the two differ in a number of key ways. Italian beef sandwiches consist of roast beef piled onto a sub roll. The sandwich is served dripping with the juices from the meat. Obviously there are a number of variation on the recipe, but the sandwich also generally includes peppers, either sweet or hot. The Italian beef sandwich hasn’t been monetized the way the Philly Cheesesteak has, so restaurants serving it outside of the greater Chicago area are rare. However, Pop’s recently opened a new location in Kalamazoo, Michigan, so I figured it was time for me to give the Italian beef a shot. A pretty epic meal, overall. 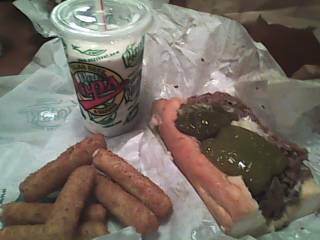 I ordered a regular Italian beef sandwich, as well as a side of mozzarella sticks and a Reese’s Peanut Butter Cup milkshake. I had sweet peppers and mozzarella cheese on my sandwich, although hot peppers were also an option. The sandwich was enormous. It had an entire sweet pepper on it, as well as a huge portion of beef. It had a rather simple taste, owing a lot to the few ingredients. The beef was expertly prepared and heaped on. The mozzarella and peppers were good, although next time I might order the hot peppers for a little more contrast. The sandwich was somewhat wet with the juices, but not to an obnoxious extent. All in all, it was an impressive sandwich which lived up to the reputation of the Italian Beef sandwich. In addition to Italian beef, Pop’s serves myriad other sandwiches, including hamburgers, hot dogs, gyros, and more. They also have a ton of sides, such as fries, chicken rings, mozzarella sticks, and the like. The sandwich I had was $4.15, a little bit pricier than I’d expected, but still worth the trip. I would definitely recommend Pop’s Italian Beef and Sausage for their delicious and unique (around here) sandwiches. I wanted to hear more about the Reeses’ shake. I’m aware that this is a sandwich blog, but you can’t spell sandwich without an S (which is in the word shake)!